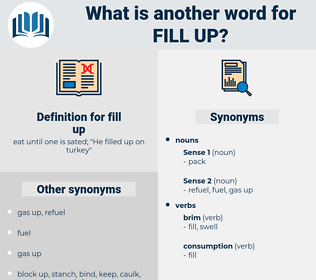 What is another word for fill up? 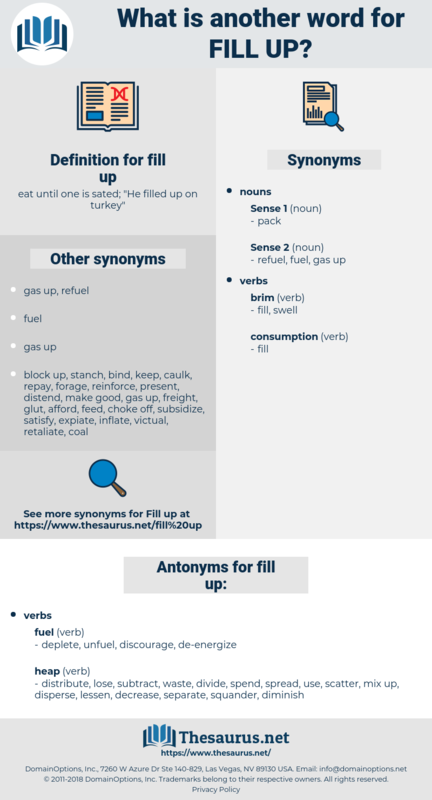 eat until one is sated; " He filled up on turkey"
distribute, lose, subtract, waste, divide, spend, spread, use, scatter, mix up, disperse, lessen, decrease, separate, squander, diminish. decline, ruin, cancel, destroy, dodge, reject, ignore, neglect, break, forfeit, worsen, damage, deteriorate, miss, hurt, shun, stop, refuse, weaken, kill, dismiss, avoid. injure, take away, reduce, lower, dissuade, let down. conglutinate, stop up, secure, seal, coapt, plug.